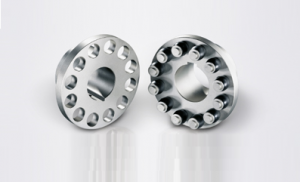 RUPEX couplings are used as flexible compensating couplings in all applications requiring a reliable transmission of torque under harsh operating conditions. The conical seats of the buffer pins facilitate mounting and guarantee maintenance-free operation. The optimized shape of the barrelled buffers allows simple plug-in assembly and low circumferential backlash. Many type variants are offered, e. g. with brake disk, axial play limiting device, or brake motor couplings. Ruplex couplings can also hold loads when overloaded and are therefore especially suitable for drives for safety and reliability. Requiring little maintenance, Rupex couplings use elastomer buffers as wear parts and only these need to be replaced. Coupled machined need not be moved to effect this change.